1. Cut the aubergines into thick fingers, place in a colander over a sink and sprinkle lightly with salt. Leave for half an hour or longer if you have time. Wash and pat dry. 2. Heat a large frying pan over a high heat and dry fry the aubergines on each side for 5-10 minutes until they begin to char on each side. Remove and set aside. 3. Meanwhile, remove and discard the outer layer of the lemongrass and roughly chop. Place in a mini food processor with half the salad onions, the garlic, half the chilli and 1 tomato, roughly chopped. Blitz to a paste with a splash of water. 4. Heat the oil in the frying pan over a medium heat and add the paste. Add the ginger and turmeric to the pan. Finely slice the remaining salad onions, chilli and coriander stalks (reserve the leaves for garnish) and add to the pan. 5 Quarter the remaining tomatoes and stir into the mixture along with the aubergines, coconut milk and a good splash of water. Bring to the boil then cover and simmer gently for 30 minutes until the aubergines are soft and the curry is saucy. 6. 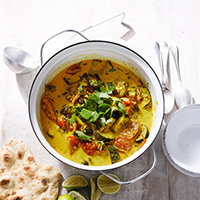 Remove the curry from the heat, squeeze over the lime, scatter over the coriander leaves and serve with naan bread. This recipe was first published in Thu Mar 10 12:23:00 GMT 2016.